Good ol’ pancakes are one of my favorite cheat meals. It’s just hard to beat. 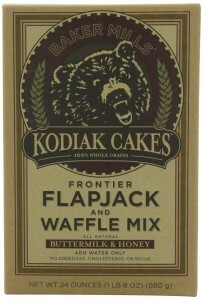 Accordingly, I’ve tried a LOT of recipes and mixes, and I keep coming back to the Kodiak Cakes Flapjack and Waffle mixes. This one in particular–BUTTERMILK & HONEY–is my favorite. It tastes great, is relatively healthy (whole wheat and oat flour, and no artificial junk), and it cooks perfectly. If you’re into pancakes, give this a go. You won’t be disappointed.